While he taught her how to make love, she taught him how to love. Thus sang Fabrizio De André, the legendary Italian singer-songwriter who left us almost twenty years ago to the day. Packed into these few words is, I think, the potential in that half of the world that is still rarely listened to and continues to struggle to participate in the important decisions concerning society, politics, and economics—including in so-called developed countries. “Teaching how to love” means taking time to reflect, contend with one another, and ask ourselves if our actions will lead us to fulfill a goal that will benefit the community. I admit I’m biased (how could I be otherwise?) when it comes to this editor’s note and this particular issue of i-Italy Magazine, which is primarily dedicated to telling women’s stories. To be clear: what you’ll find here are just a few of the many stories about women out there, and they weren’t chosen with any specific criterion in mind. They were put together intuitively, as they came to my attention. They’re not representative nor are they meant to be. Leafing through the magazine, I realize I’ve placed a wide variety of stories side by side, making a heterogenous world, a real salad—and that’s our main reason for choosing an image of a red-haired girl in a salad for the cover. It’s also a playful way (long live irony and self-awareness!) to talk about the world of women while poking a little fun of Chiara Ferragni, the best-known Italian fashion blogger who became a major entrepreneur of her own image (see page 39). Getting her start in 2009, long before Instagram, with a blog called “The Blonde Salad,” Chiara was named the number one fashion influencer in the world by Forbes last year. Her marriage to the rapper Fedez was followed as if she were a princess. Celebrating it on social media, the genius marketing couple decided to give no network exclusive rights to air it: they wanted everyone to be able to share in their ceremony. The result: a wedding with 20 million followers. 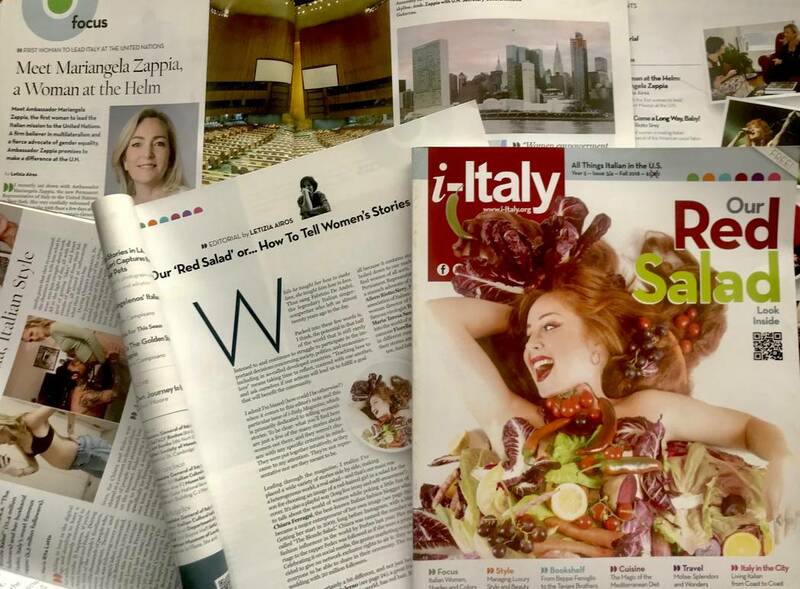 Our salad is certainly a bit different, and not just because the model, Alessandra Salerno (see page 24), a great friend and a rising star in the Italian music world, has red hair. But most of all because it contains stories of many women that cannot be boiled down to one marketing stereotype. In our salad, you’ll find women of all sorts. Mariangela Zappia, the first woman Permanent Representative of Italy to the United Nations and a staunch advocate of multilateralism and gender equality. Dr. Aileen Riotto Sirey, President Emeritus of NOIAW, the largest association of Italian-American women. Barbara Jatta, the first woman director of the Vatican Museums. The internationally famous virologist Ilaria Capua. The entrepreneur from Puglia Maria Teresa Sassano. And a group of women breathing life into the world of music, including the living legend of the Italian canzone Fiorella Mannoia and many other voices who, though in different musical genres, all navigate a tough world. Read their stories and then go find them on the net. Give them a listen. And listen to contemporary Italian music. Beautiful stuff. I hope that my dedicating the introduction of this issue to the world of women will lead people to reflect on the various contributions women have made, even if it’s still not without a struggle. Women who rarely put their egos before their goals. Who know how to lead but also negotiate compromises when necessary. Some career women, some women whose daily lives, with their families, are an asset to society. And they’re not the only ones out there every day—there are also our mothers, wives, daughters. It was our choice not to directly take up the subject of the #MeToo movement in vogue today. There is a grave risk, in my opinion, of a boomerang effect. I fear it’s become a slogan more than a condemnation. And the condemnation needs to be made every day by all women who, to various degrees, suffer injustice and violence, who simply have to be ten times as good as a man to occupy the same positions of power. Forgive me. I realize I haven’t mentioned the rest of the magazine’s contents. But you can discover it on your own as you have a look through. I’ll just say a word about why Molise is the focus of our Travel section. We chose it because it’s a small and stupendous region that has everything, the seaside and the mountains, art and culture, but still remains little known and off the map for tourists. It is a region with a lot of vulnerabilities yet amazing strengths as well. We’re convinced that the experience Molise has to offer visitors is extraordinary and unforgettable.